I'm looking for help from someone technically savvy who has access to a Linux system. I'm trying to create a HFS with Prince of Persia 2 for Mac, but for some reason it's not working. Not sure exactly what's going on there, other than that it appears that the disk changes are never actually being written back to disk. Not sure exactly why you're going through all that work though; you just need to create a 20MB file and change the extension from .txt to .hfs, then add it as one of your mount images. When your OS boots up, it'll ask you to initialize it. Let the OS do that, then expand the stuffit file onto the freshly created volume. Then shut down, change which volumes get loaded and start it back up again. Thank you for looking into it adespoton. That is a nice alternative solution, I'll use that. By the way, apparently pop2.hfs is an "ISO9660/HFS hybrid", and lsar only sees the ISO9660 part, while Mac OS only sees the HFS part. Someone mentioned this on another forum where I had cross-posted my request for help. Just a word of warning: Prince of Persia 2 doesn't run very well in Basilisk or SheepShaver; the background music is badly garbled. It works much better in MESS, although that emulator is more difficult to set up. Someone did an article on it a while back; PoP and PoP2 actually have improved game assets in the Mac version. Which guest architecture were you recommending in MESS? I tried using mess with ~/mess/roms that contains maciici.zip. And in maciici.zip I use 368cadfe.rom, because my "$ mess maciici -lr" told me it required that ROM. Newer mess versions may require a maciici.zip with 341-0735.um11, 341-0736.um12, 342-0733.um9 and 342-0734.um10. Anyway, I then ran "$ mess maciici -listmedia" to see the supported media, and tried to run "$ mess maciici -flop1 System70_boot.dsk". But it seems mess' Mac emulation only supports 800k floppies at this time. Probably a better solution would be to use Mini vMac's Mac II emulation; it can use the same IIci ROM that MESS uses, but it actually works. And the emulation is more accurate than BII. You'll likely want to be in 256 color mode, 800x600 screen resolution (might need 640x480), and any disk image will be accepted. You can turn on more accurate emulation, and tweak the other settings as needed. Also: if you're using BII, try adjusting whether you are using JIT or not, as well as switching between Performa and Quadra emulation; try different screen depths and resolutions as well. You may find that PoP2 has a very specific configuration that works well. I have found that BII requires a 4:3 screen ratio to enable fast screen redraws, for example. Sorry for the delay in getting back to this topic. MESS works fine with hard disk images, and I've got a screenshot to prove it. Haven't tried it with 7.0, but maciici with 7.5.3 works great. You have to use chdman to create the hard disk image, and then I think you have to convert anything you want to put into it into chd format as well. It's definitely not fun, and I remember having to fiddle around with it a lot when I set mine up years ago, but it works. 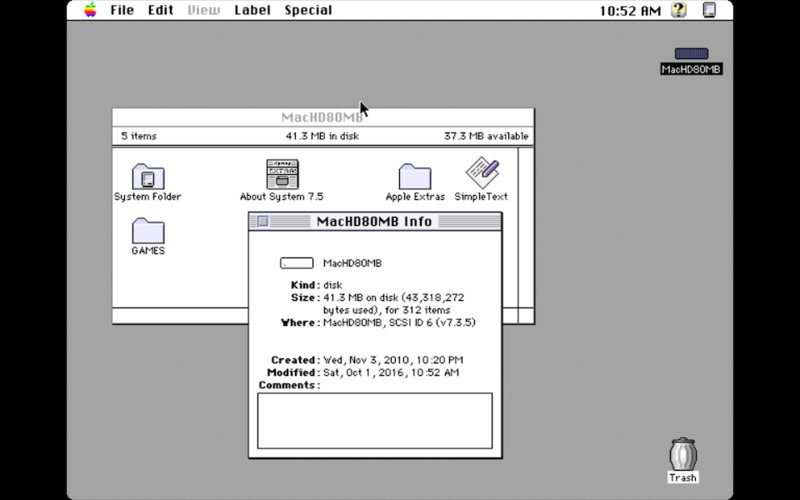 Unfortunately, Mini vMac's Mac II emulation isn't quite there yet. Whenever I try to start Prince of Persia 2 in it (3.4.1, built from source with Mac II target), I get a bomb message with "Unimplemented Trap". Hmm... could you try that with 3.5 alpha (Mac II)? If there is indeed still an unimplemented trap, this is where Paul would implement it. If it's working in MESS, that means that there should be enough documentation to implement it in Mini vMac. That said, I'm starting to think I need to compile a Mac II-specific MESS, that will auto-load the drive images and ROM. Still gives the unimplemented trap with 3.5 alpha, over here. A long shot for sure, but I seem to recall that PoP did run quite nice with FusionPC. Not in DOSBox of course but on an old PIII or P4 with WIN98/DOS as guest OS. The downside is another old computer heating your room. I´ll try PoP2 to see how I fare with FusionPC one of these days. Been ages since I tried this, but I remember PoP1 working fine in Basilisk/SheepShaver. It's only PoP2 that misbehaves (and oddly enough, its demo version runs fine).